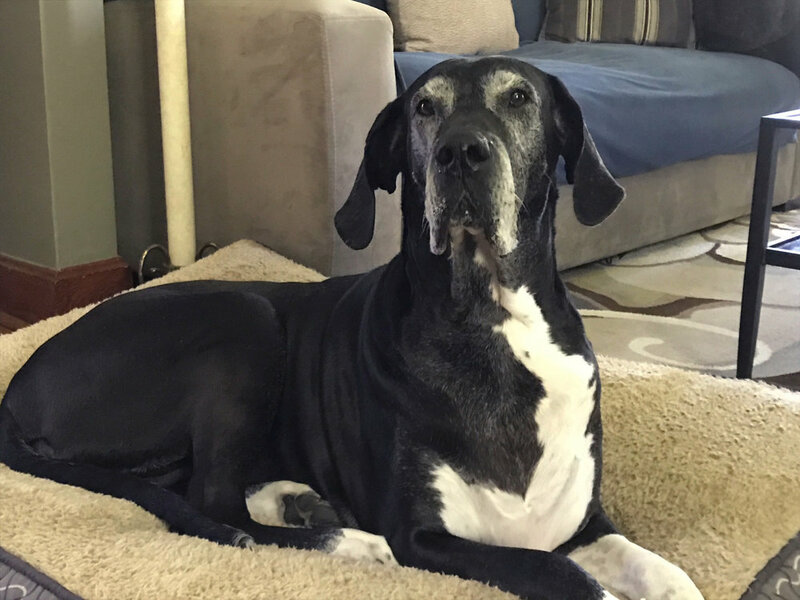 Dempsey, our beautiful Great Dane, was diagnosed with lymphoma in May of this year. We knew something was wrong because his energy level had just disappeared, and he stopped eating. His primary care veterinarian, Dr. Fatcheric at Fairmount Animal Hospital, broke the news to us that Dempsey had Lymphoma. As we tried to come to grips with the news, Dr. Fatcheric told us about the treatments that were available for lymphoma patients at Veterinary Medical Center. We made an appointment to meet with Dr. Rassnick to evaluate Dempsey's condition. After his initial blood work, and a biopsy, it was confirmed that Dempsey had stage IV B-cell lymphoma. He had received good news though, his lymphoma, was treatable! Dempsey started his first treatment for lymphoma at our first meeting with Dr. Rassnick. Once we received the test results, his program was tailored to fit what treatment he needed. He went in remission within one week of his first treatment. Dempsey did very well with the chemotherapy program. He started out with a 5 drug program, and within a month and a half, progressed to a 10 drug program. He went through his treatment with no side effects, due to the preventative drugs he received while getting chemotherapy. 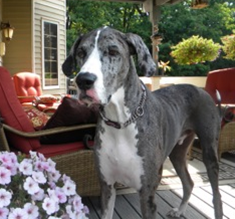 Throughout his treatment, Dempsey had the energy of a young Great Dane again, and was going on 2 mile daily walks. We also have a camp in the Adirondacks, which he thoroughly enjoyed throughout this summer. He went on walks and hikes at our camp, without tiring. Dempsey received a second chance at life once we decided to have his lymphoma treated. We can't thank VMC enough for all they have done for our gentle giant and for giving us hope, when it seemed there was none. Thank you again, Dr. Rassnick, and the staff of Veterinary Medical Center. 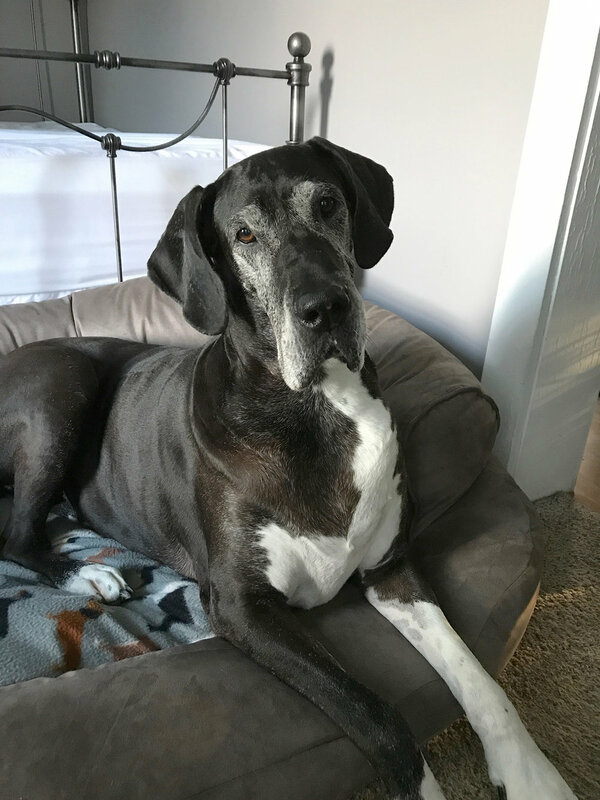 Dempsey lost his struggle with Lymphoma late last year, but we were so happy to help this wonderful dog and his family enjoy another beautiful summer and autumn. It was impossible not to fall in love with Dempsey (and his people! ), and we still miss them all terribly at VMC.